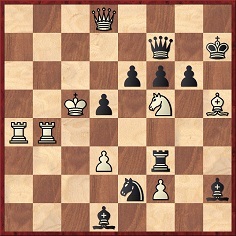 1 Rb7 Qxb7 2 Bxg6+ Kxg6 3 Qg8+ Kxf5 4 Qg4+ Ke5 5 Qh5+ Rf5 6 f4+ Bxf4 7 Qxe2+ Bxe2 8 Re4+ dxe4 9 d4 mate. 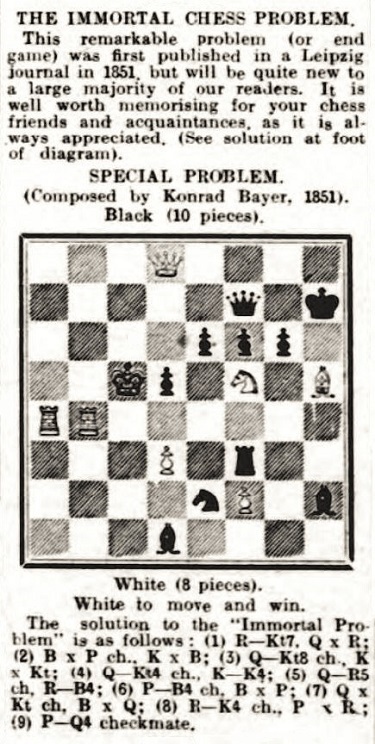 Meyers Schach Lexikon (1993), page 31: ‘Leipziger Illustrierte Zeitung, 1855’. D.J. 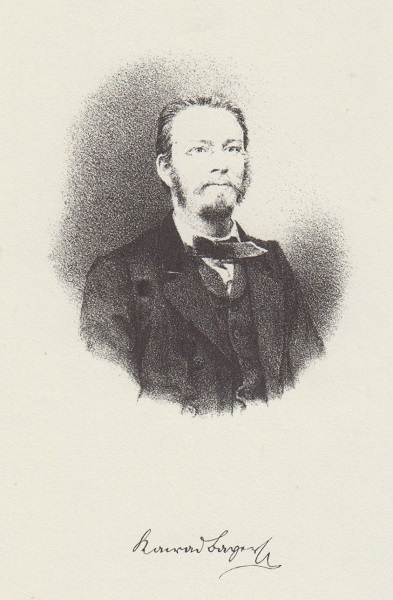 Morgan discussed the problem in the BCM (July 1960, page 200 and February 1962, page 53); both items referred to The Era of 6 July 1856, and the second one added ‘Leipziger Illustrirte, 16 August 1851’. 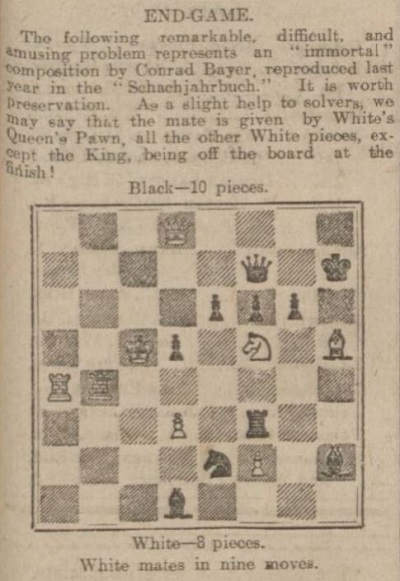 The solution was given on page 13 of the 10 August 1856 edition of The Era. 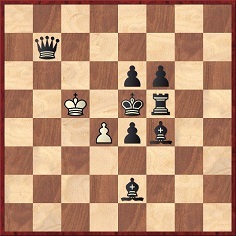 It is unclear why the Dictionnaire des échecs stated that the composition won the Era competition. 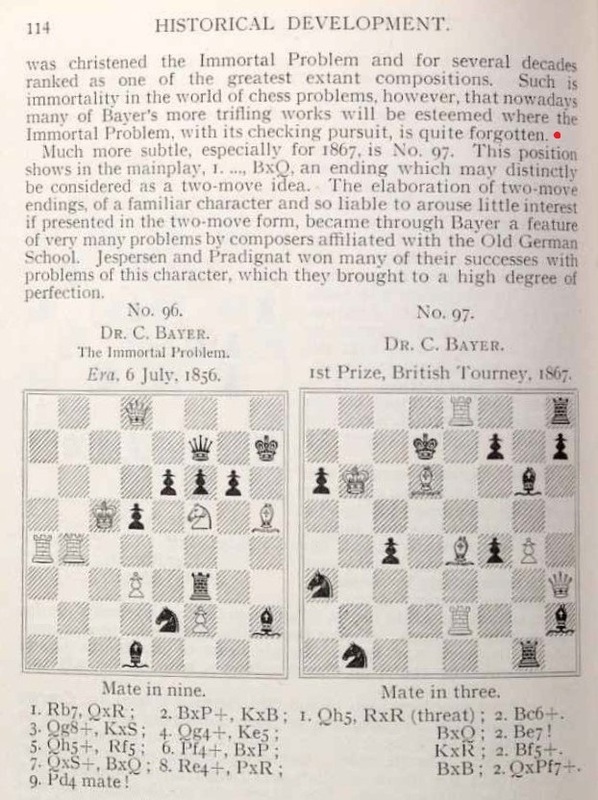 That contest, won by Bayer, concerned a set of two three-movers, two four-movers and two five-movers (The Era, 6 January 1856, page 13). 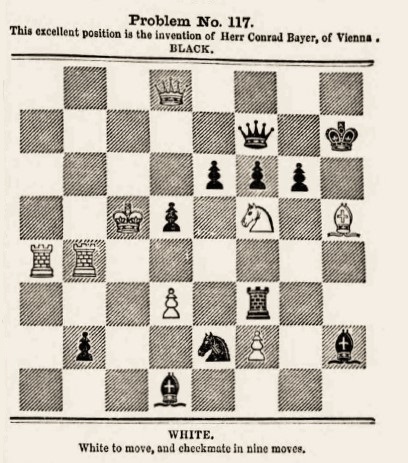 Bayer and the other winners were announced on page 13 of the newspaper’s 18 January 1857 edition. 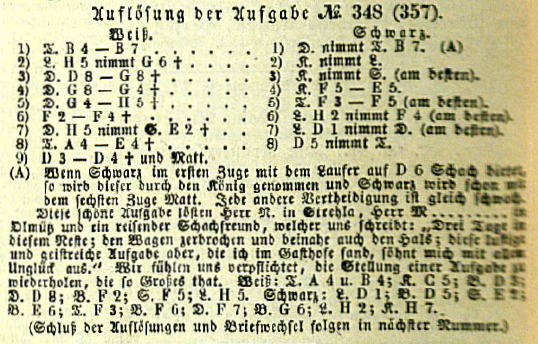 See too pages 61-63 of the February 1857 Deutsche Schachzeitung. 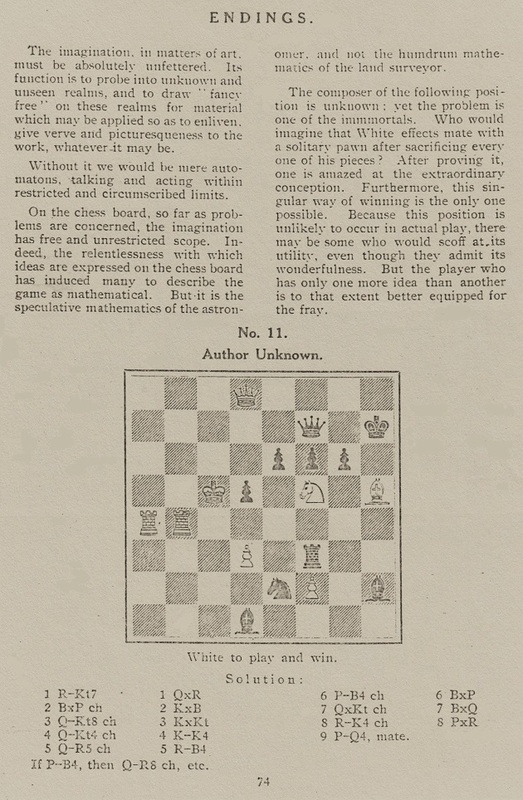 The Cleveland Public Library has confirmed to us that the nine-mover is not included in Löwenthal’s book on the problem tournament (London, 1857). The problem was indeed in the old style, but the term ‘forgotten’ cannot be justified. 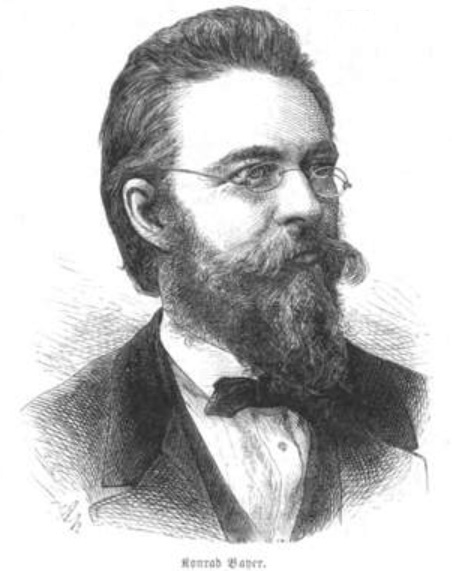 It will be noted that Bayer was identified as the composer. 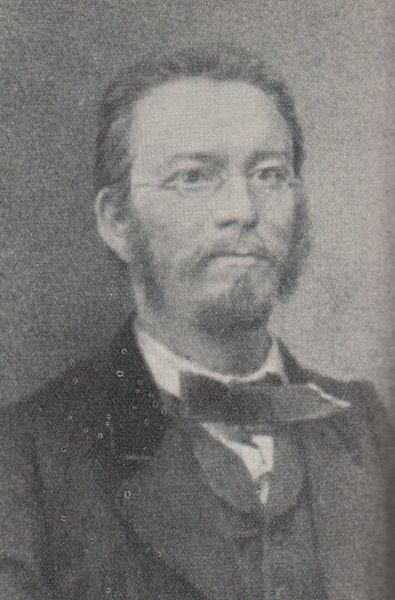 His problem was the subject of a detailed historical article, ‘Die unsterbliche Aufgabe in neun Zügen’, on pages 298-300 of Heft 7 (1900) of F. Amelung’s Baltische Schachblätter, an article reproduced on pages 66-68 of the March 1900 Wiener Schachzeitung. 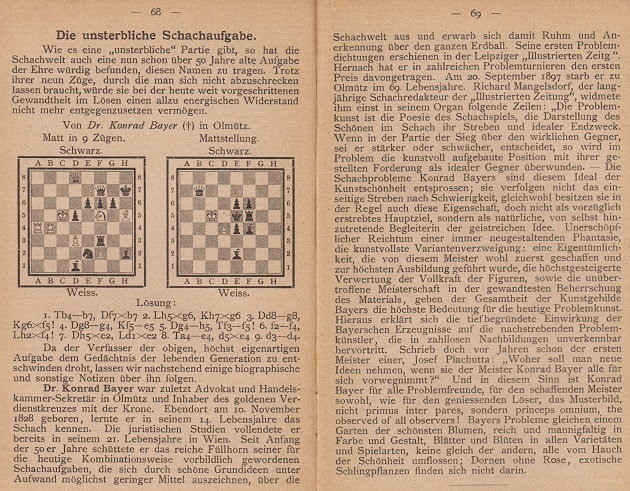 See too ‘Die sogenannte unsterbliche Aufgabe’ on pages 211-214 of the May-July 1907 Wiener Schachzeitung. As mentioned in C.N. 7728, the Wiener Schachzeitung is available on-line at the ANNO website. Claims that Bayer’s problem was/has been forgotten are further undermined by its appearance in popular books, e.g. 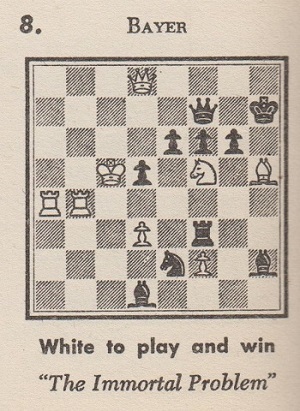 Chernev’s The Bright Side of Chess (page 80) and Reinfeld’s The Joys of Chess (pages 113-114), as well as on page 110 of Tal’s Winning Chess Combinations by Tal and Khenkin – quite apart from all the reference books cited at the start of the present item. 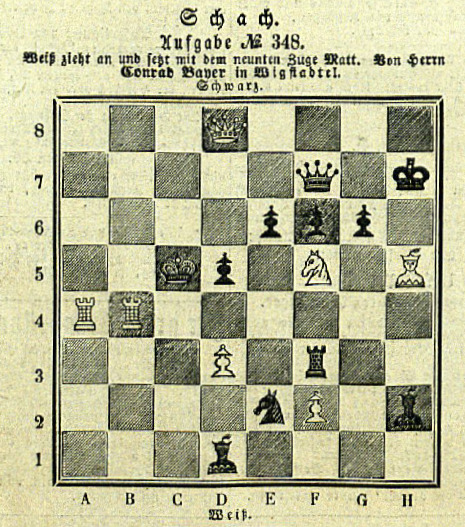 Illustrirte Zeitung, 6 July 1872, page 18. Latest update: 30 June 2017.